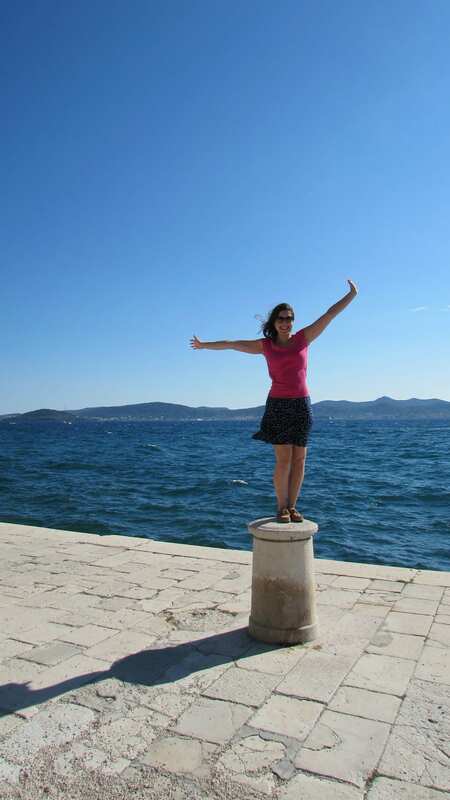 Confession: we did not see nearly as much as we intended to in Zadar, Croatia. This coastal town, complete with Roman ruins, deserves much more than the half-speed pass through we gave it during our 3 day visit. Which, leads me to another big theme of today’s post: plan for downtime. Our June 2015 trip was our first multi-country jaunt. In general, our pace was okay for us (averaging 3 full days, with travel days in between, in each destination). 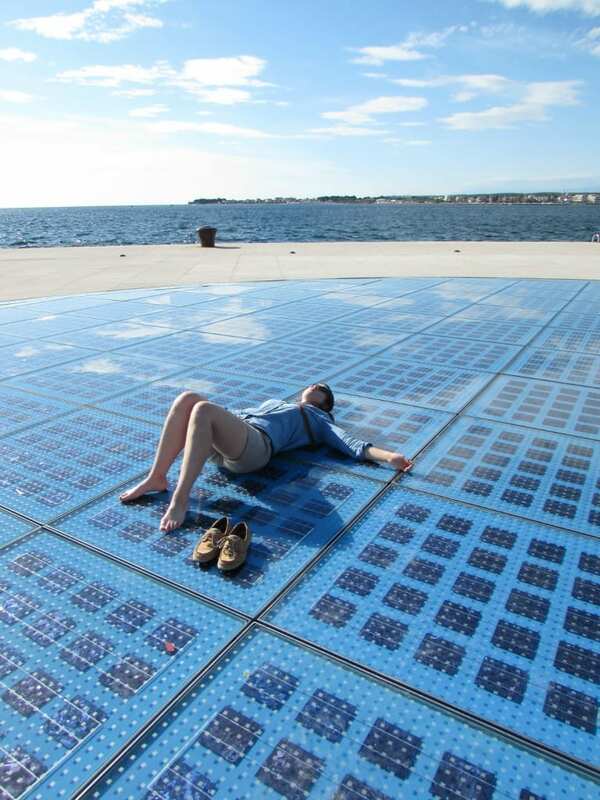 It caught up to us, however, in Zadar. Coming fresh off of two solid days of hiking at the Plitvice Lakes, and moving into our fourth destination in less than two weeks, everything about us was exhausted: mind, body, soul. Though, this is a pretty awesome place to be exhausted. 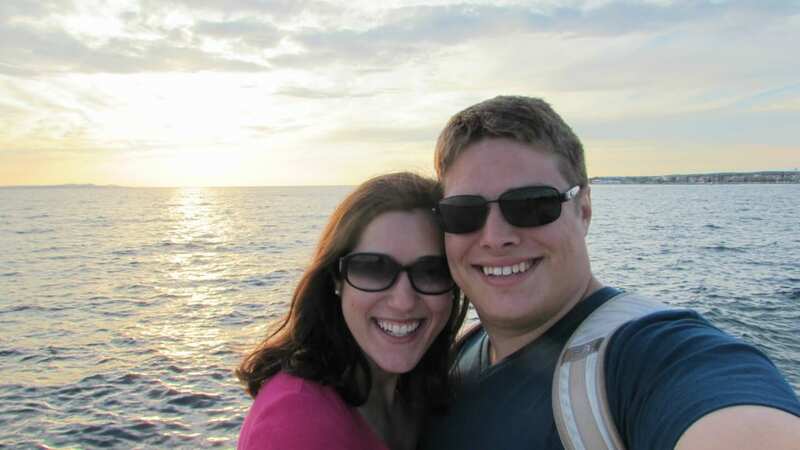 After a long afternoon of browsing reddit while half asleep and feeling guilty for not making the most of our time, we came up with a new rule that would serve us well in the future: plan a “downtime day” or two every couple of weeks while traveling, especially while moving fairly quickly through destinations. These downtime days serve the purpose of being guilt-free relaxation time: time when you can turn off the traveling part of your brain, and catch up on some much needed rest. I think the feverish desire to travel as fast as possible, and see as much as possible, is perfectly natural and I imagine most travellers fall victim to the idea at some point. Without adequate rest, though, the overall experience at any given place will be more shallow. This is an ongoing challenge–we are planning a major trip in the next few months, and the temptation to trim an easy going day from this destination or that to try to squeeze in another city is constant, but we are holding our ground so far. 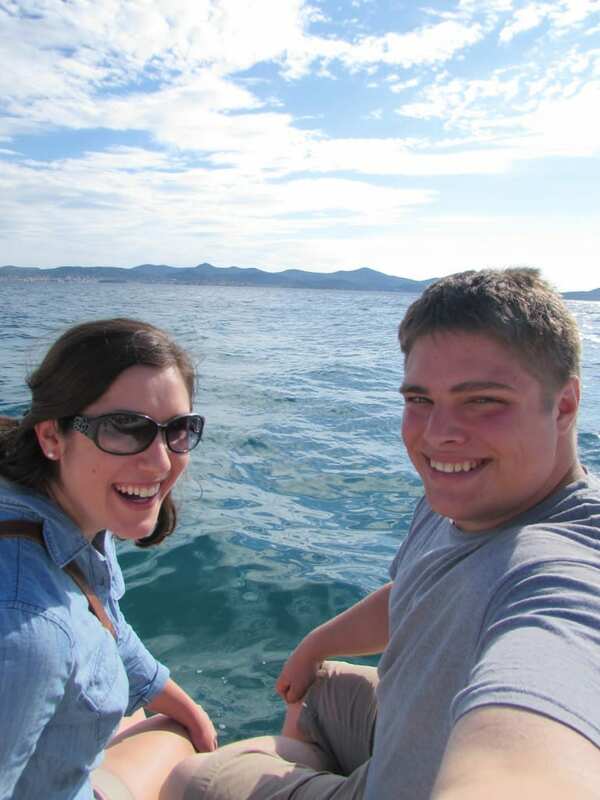 Now, all of that being said, what we did see of Zadar was wonderful. 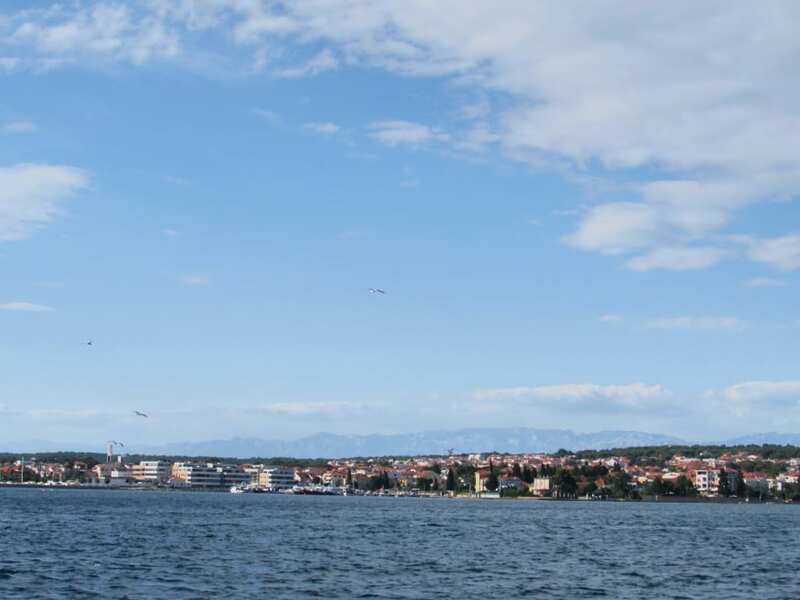 We initially picked the town because we wanted to (a) see the Adriatic sea while in Croatia, and (b) find a good budget airline hub that could take us back vaguely in the direction of the States for our final destination, to make the journey home more simple. Therefore, we landed in Zadar with a plan to make a smooth exit to Ireland via Ryanair. 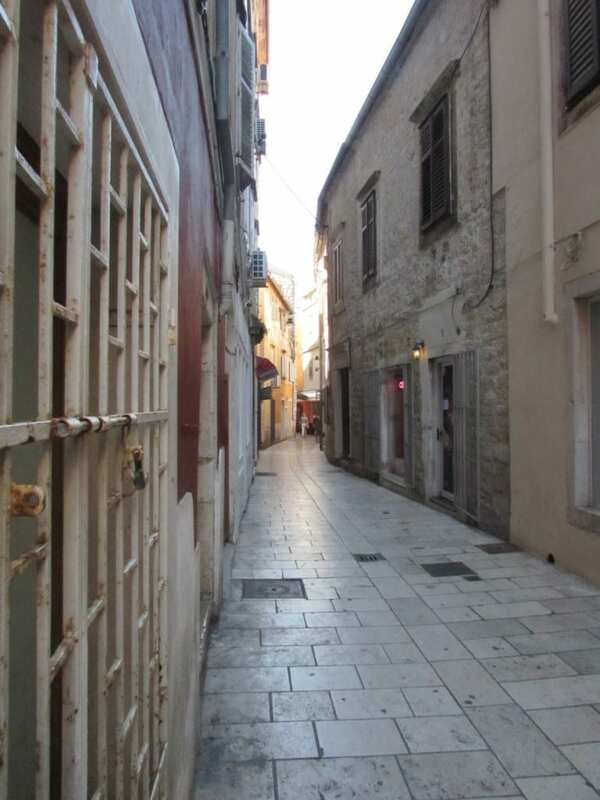 We didn’t go wrong: Zadar has a charming old town, which is completely walled (dating back to the Roman days). The old town has gorgeous architecture and breathtaking views of the Adriatic sea. It also has that incredible ”je ne sais quoi” that you get in some European cities: tiny, tight stone streets flanked by towering buildings, packed with outdoor bars, restaurants and cafes. The old town is primarily car-free, which I think gives it an additional level of charm. It is the perfect place to get lost, and we had a lot of fun wandering around with no purpose. The side of old town Zadar that faces the Adriatic sea is an interesting site: there is no beach, but there is a wide, white pathway that extends from one end of town to the other. On this path is the famous sea organ The organ looks like several wide, long steps or benches, but if you sit and listen–the ocean water moving in and out really does sound like an organ. Jeremy on the sea organ. 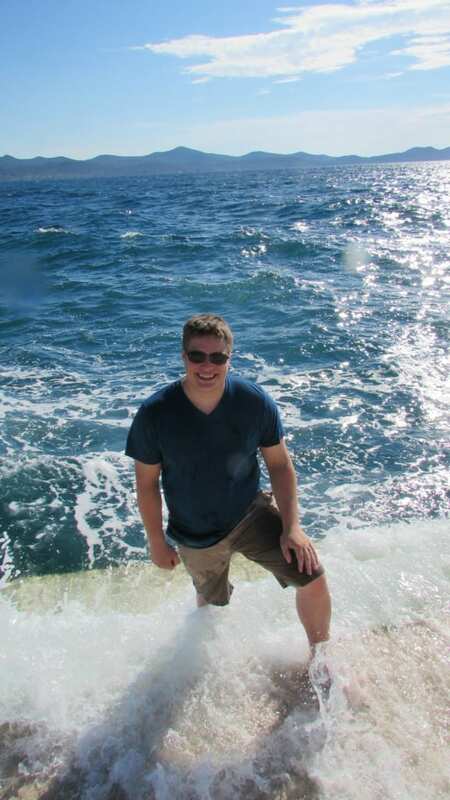 That water was so much colder than it looks. A few steps away is “The Greeting to the Sun”, which is a pretty name for a gigantic solar panel laid into the ground. It is said to be a beautiful light show at night, which we did not see due to exhaustion/laziness, but I thought it was gorgeous in the daytime as well–not to mention an exceedingly warm and pleasant place to take a short nap. By far and away, our best meal in Zadar was at Restaurant Bruschetta. We landed there for our “splurge” dinner on the recommendation of our Airbnb host, and she was dead-on. We started with the bruschetta (how could you not?). I followed that with meat lasagna, and Jeremy, being braver than I, devoured the black risotto. Primary ingredients: squid and squid ink. Not my thing, but according to him, it was wonderful. 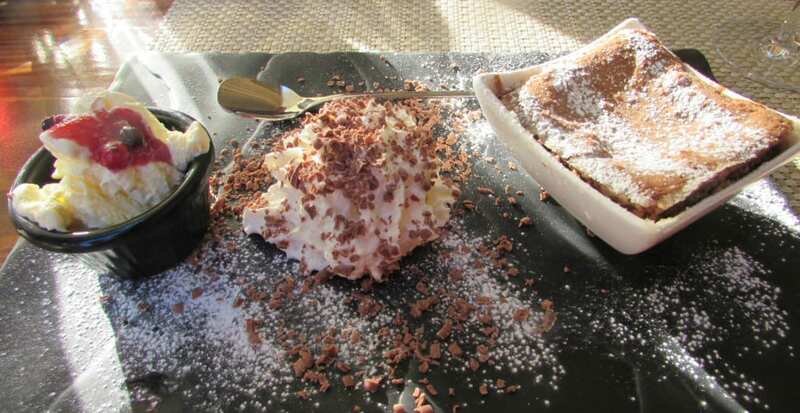 We chased that with two orders of the most delicious chocolate dessert I have ever tasted. The total cost of our splurge, including my two glasses of champagne and his beer? 44.28 USD. Not bad, in my opinion. My taste buds miss this. Part of the not-seeing-as-much-as-intended results mean that we skipped over the archaeological museum, only a short walk from all the sights listed above. 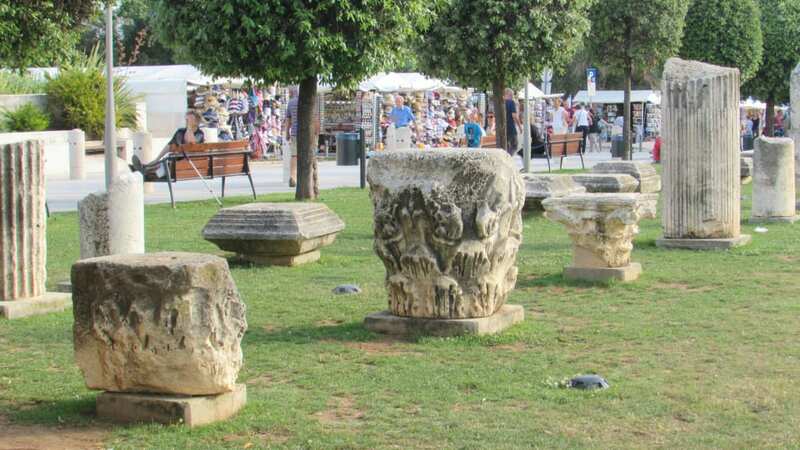 Outside the museum, in a large square facing the sea, however, are large remains of various stone columns. It was a beautiful site, opening up to a former Roman forum. 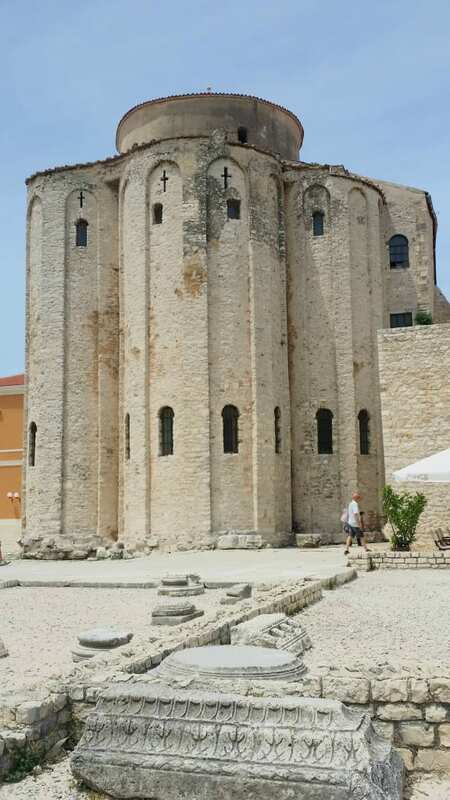 St. Donatus Church is ahead, which was one of my favorite buildings in Zadar. Dating back to the 9th century, St. Donatus Church was constructed from repurposing the Roman forum that once stood in its place–original columns and flooring can still be viewed from the inside. It is a remarkable site, both in and out. One thing I would change about our trip was location. We stayed in an Airbnb apartment about a 10-15 minute walk from old town. It wasn’t a terribly big deal, and our walk took us through a shady park, but in retrospect, I wish we would have just decided to stay right in the old town, given the length of our visit. I would love to make another trip to Zadar one day (and Zadar would make a perfect first stop on a Croatia road trip), but 3-5 days is certainly enough, depending on your speed of travel. It could be done in 1-2 for someone who is, say, jumping from location to location while working through a longer Croatia itinerary–but I wouldn’t recommend it, especially if you want to visit nearby spots like Dugi Otok. 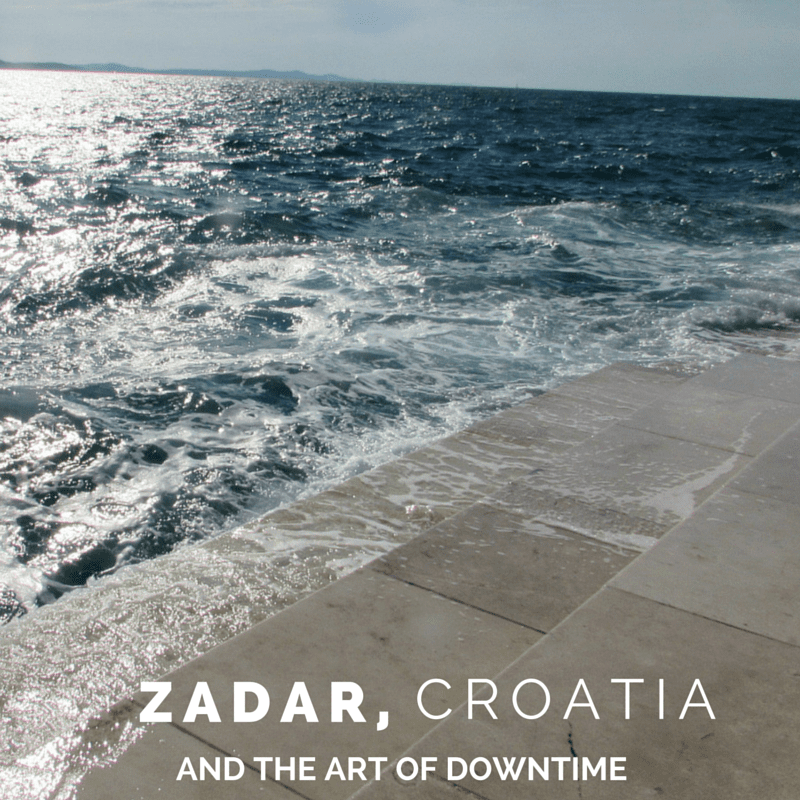 If you’re going to need some downtime (and that’s pretty much a given at a fast pace)… Zadar is not a bad place to crash.